Dear Mr. M by Herman Koch. Hogarth, 2016. Paperback. 448 pages. 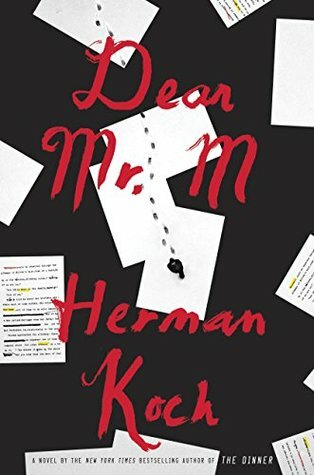 This is the second book I've read by Herman Koch (the first being The Dinner) and I can already tell that Koch has a very unique and very distinct writing style that is all his own. Putting this writing style into words is extremely difficult, but for me it always elicits extremely mixed feelings. While I may not be overly enamored with the story itself, the ideas that Koch plays with and the unique storytelling methods he uses are enough to capture me and keep me reading. In Dear Mr. M, Mr. M is an aging writer whose 'glory years' are slowly starting to fade, but who also still has a strong older fan base and thus still partakes in interviews and book signings. We are informed of two of his most popular books, 'The Hour of the Dog' and 'Payback.' The former was written after his first divorce, and was seen by many as discussing too many intimate details regarding the divorce, while the latter is based on a different real life story: the story of the disappearance of a history teacher after he involves himself in an affair with one of his students. I don't want to go into too many details regarding the specifics of the plot, since I feel that much of the entertainment in this book revolves around your own discovery, so I'm going to be a little vague. The story jumps around quite a bit, and although this is a tad confusing, it somehow worked for the story, as the plot itself and the way in which the story is unfolded is very patchwork-like in nature, and thus the jumping points of view worked well to match the atmosphere. This plot is extraordinarily intricate and sometimes feels hard to follow, but as long as you just jump in and commit to the ride, things eventually start to pay off. Koch writes really odd characters. They aren't very likable people. They're often harsh, honest to a fault, and basically just not the nicest people out there. Just like in The Dinner, I started off thinking I liked a few of the characters, only to discover just how disturbing or unkind they really were as time went by, which is an odd feature of Koch's writing that is also rather endearing, as it creates an immense amount of mystery and intrigue to the entire story. I loved Koch's insights into human nature, our motives for doing various things, how we perceive events, and even how physical attributes affect our lives, even if we do not consciously notice it. He tends to go off onto what feel like tangents to contemplate these ideas, but he never strays too far from the story, and somehow manages to work everything into one larger idea. This book also focused on lot of the art of writing itself, such as what works in fiction versus what happens in reality (i.e. unbelievable coincidences), and this also really made me think about a lot of various ideas. My only critiques center around the fact that I do think Koch could have edited out a few areas that seemed to go on to long. Koch tends to focus on minute details and subsequently spend a few pages discussing them. He also dives off into a few areas relating to Dutch politics and history, which I assume might be more interesting to those living in the Netherlands (maybe? ), but that really could have just been cut right out for me. I had no idea what was going on and, frankly, I didn't much care. Critiques aside, this was overall a fairly solid book. While I did find myself feeling a bit confused or lost at times, the strength of this novel lies in the story and twist and turns, and for those reasons I am giving it three-and-a-half stars.